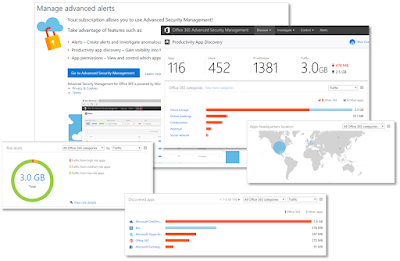 In the middle of 2016, Microsoft released the first version of Office 365 Advanced Security Management, a new capability within the Office 365 platform that allows organizations to go above and beyond the typical security management features, helping them to better secure users, permissions, content and apps. This multi-part blog series will look at how to use the features that make up Advanced Security Management (ASM) and share technical details that will help you to understand the benefits of these robust tools. 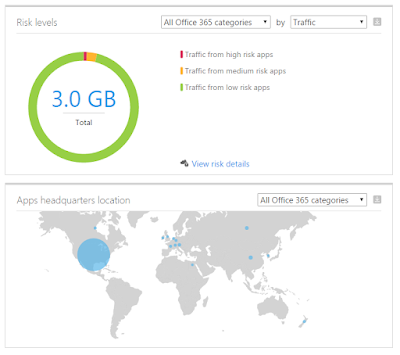 A Practical Overview of Office 365 Advanced Security Management - Part 1. 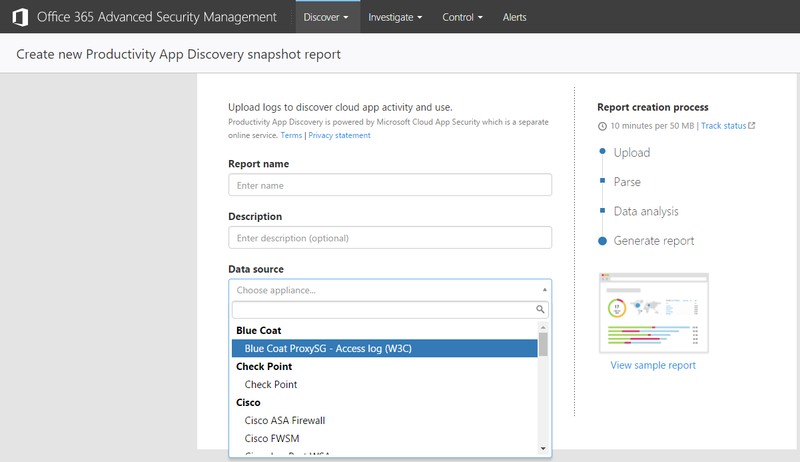 In part 2, we review the Productivity App Discovery Dashboard capability of ASM to see how log files are imported, how to create reports and review the results of ASM's analysis of those logs, and how you can try it out with some built-in sample logs. ...and then there is an Other (unsupported log format) option as well, if you have some other solution in your network. Once you've selected your solution type, you click Browse, select your log file and upload it for processing. You may upload multiple log files at once. Once uploaded, ASM will process the file to analyse traffic going through your network security solution and produce the Discovery Dashboard. This process can take a few minutes, but it will let you know once that processing is complete. Once complete, your report will show a status of Ready and you'll be able to view the analytics and insights provided by the dashboard. Each log file may be up to 1 GB in size. Uploading a log file is an entirely manual process. There is no PowerShell available at this time to start the upload, nor to access any ASM functions. So the log file upload process cannot be automated unfortunately. You may only have 10 reports at a time. If you already have 10 and try to create an 11th, you will be told to first delete one of your existing reports. As your report ages, any entries that are older than 90 days will be removed from the report and dashboard results. This time period cannot be adjusted at this time. 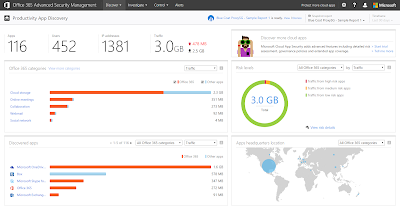 When log files are analyzed by ASM, the traffic is not only categorized by the type of cloud app (like cloud storage or social media), but ASM will recognize the individual cloud apps and let you know exactly which ones your end users are accessing. The larger Cloud App Security (CAS) solution has a catalog of almost 15,000 cloud apps that it will identify. However, a subset of those apps are recognized as 'productivity apps' and it is that subset of over 1,000 apps that ASM will identify. This list is actually a growing list, and Microsoft has a team of people working on increasing it through both manual and automatic methods. Microsoft is committed to support new apps in their catalog as soon as possible. If you have a cloud app that you know is in use and is not yet recognized by ASM, you can request that Microsoft investigate it and potentially add it to the catalog. This is typically done by opening a support request through the ASM portal (question mark on the top right of the page). 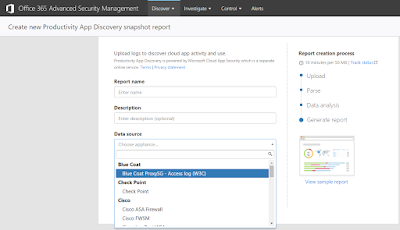 When creating a service request, you'll need to select "Cloud App Security" under the Create a Service Request list. Analyzing and providing a quick view into which cloud apps are in fact in use by end users can really help you to determine if Shadow IT is at play in your organization, and exactly how much data is moving to cloud hosted solutions which may not be IT approved. This can provide great visibility to IT and InfoSec teams, helping them to work with end users and business units to ensure they are using the corporate approved solutions and not exposing the organization to risk. You'll then see a page that describes the log format required by that solution in some detail. On that page, click the "Download sample log" button. You'll download a log file to your desktop, which you can then use to create a sample snapshot report. The log file will download as a ZIP file, which you'll have to save locally, unzip and then start the process once again to create a snapshot report. The log file downloaded will follow the proper format for the Data Source selected (the solution vendor and type). 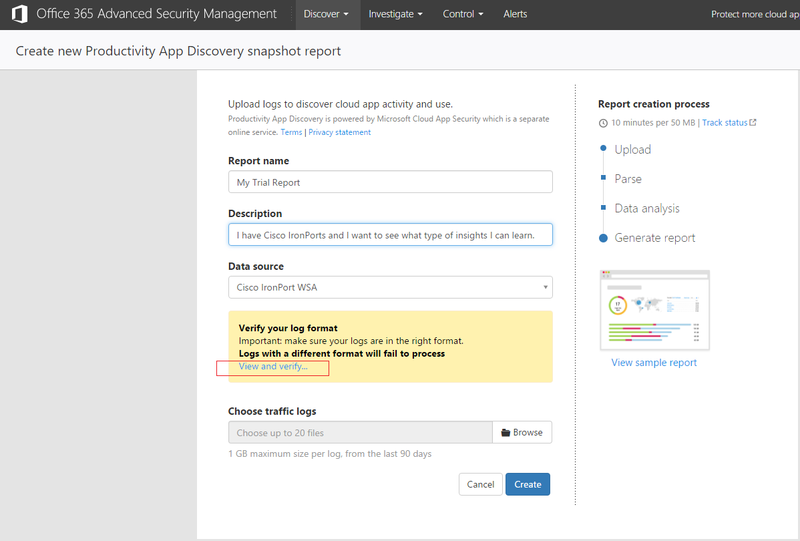 So follow the process outlined above to create a new snapshot report once again using the sample log and choose that same data source the next time through. These sample files are updated each week so that they stay fresh and do not result in expired reports (older than 90 days). 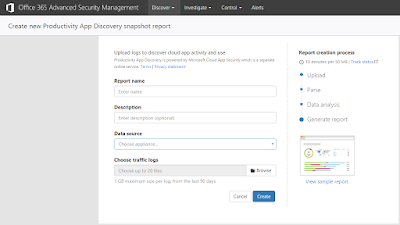 Once you've created a snapshot report, as described above, you can access the Discovery Dashboard to get an overview of the analysis performed on our log files. Remember, these statistics are only from log file entries that are not older than 90 days. As you can see, the amount of traffic that went through the network security solution is shown, and its broken up by the amount of traffic uploaded (red arrow) versus downloaded (black arrow). Moving a little further down the page on the left side, we can see the categories of cloud apps and the apps that are themselves in use. In our top table on the left, ASM has categorized the cloud applications found in my log file into the categories shown here. This gives us a quick view into the type of cloud apps in use by users, or the capability which that cloud app offers to users. 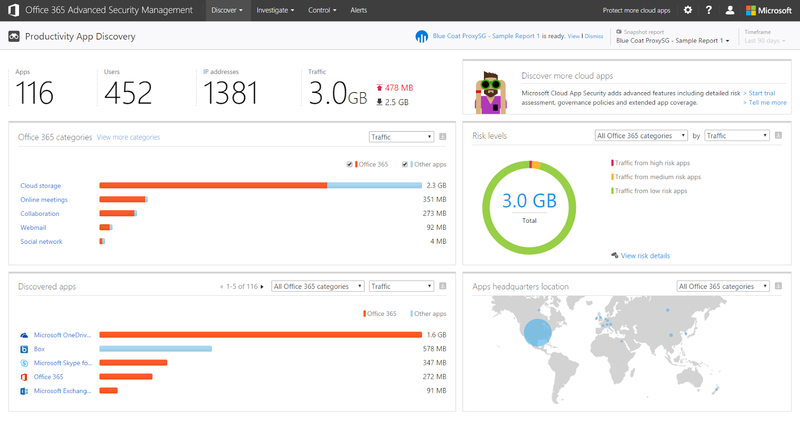 It also shows the total amount of data transmitted through that cloud app. For example, in this case we can see that 2.3 GB has been exchanged with cloud storage solutions (Box, Dropbox, etc.) and only 4 MB has been exchanged with social media cloud based apps (Twitter, Facebook, etc.). On the bottom table on the left, we see the actual cloud apps that are most in use in my organization along with the amount of traffic generated for each (in this case OneDrive for Business, Box, Skype for Business, Office 365 and Exchange). However, I can see right beside the "Discovered apps" label that there were in fact 116 different cloud apps found going through my network device. I can use the dropdowns above that table to view the other categories of cloud apps as well. So if we select social networks from the list, I see the apps that found in my log which fall into that category, no matter how small the amount of data. 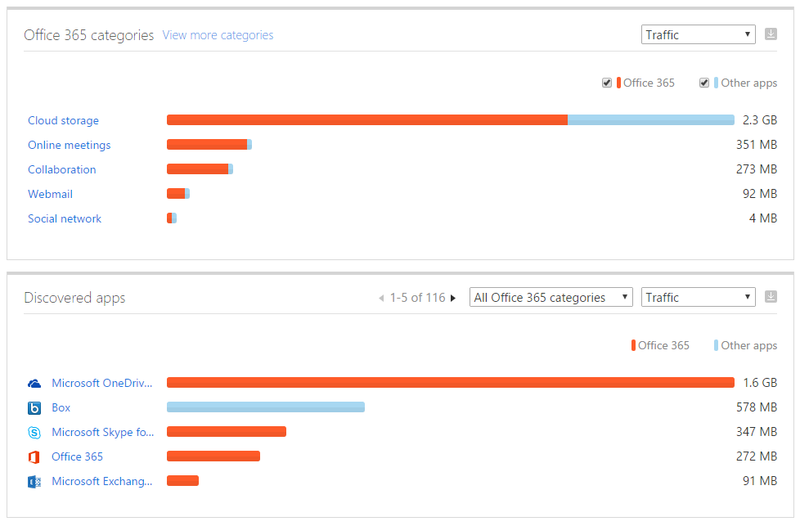 As well, you can easily include or exclude Office 365 traffic from these graphs by unchecking or deselecting "Office 365". So, if Office 365 is a corporate standard collaboration solution this allows you to easily focus on other cloud apps which may not be approved. Finally, in the diagrams on the right side of the page, ASM provides a risk score for the traffic analyzed and a map of where the traffic is originating. 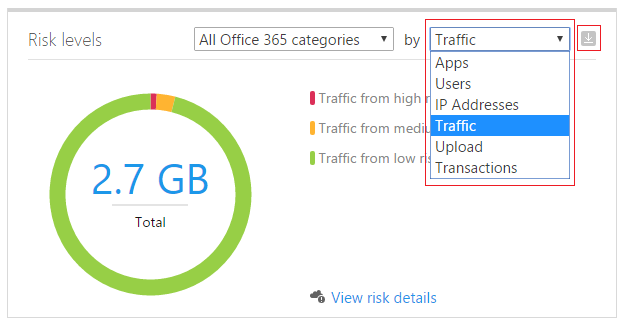 We can see in the following that after analyzing 2.7 GB in total that 4 KB is considered high risk traffic, 83 MB is considered medium risk and 2.6 GB is considered low risk. I can see these numbers by hovering over each slice of the pie. I can also see a world map in this section of the dashboard which gives me a quick view into where the traffic going through my network is originating from - the map is generated by the IP addresses found in my log file. 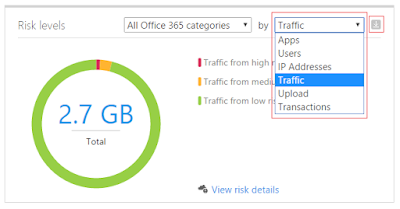 The risk level shown for the various types of traffic is based on intelligence and heuristics that ASM uses from the Microsoft Security Graph in its analysis to determine if risky IP addresses or non-reputable cloud apps are being accessed through your network. This integration of intelligence from the Microsoft Security Graph is one of the major benefits of ASM over the other built-in security tools in Office 365. You can learn more about Microsoft's intelligent security graph here: https://blogs.microsoft.com/microsoftsecure/2016/07/21/new-microsoft-azure-security-capabilities-now-available/. I can adjust this graph through the dropdown to instead focus on apps, Apps, Users, IP Addresses, Upload Traffic and Transactions. On each graphic on the dashboard, I can also click the little grey downwards arrow to download a CSV file of the traffic details shown in the graph. The CSV file is relatively simple but can be useful when we need to generate reports for others in the organization. The Productivity App Discovery Dashboard is a great solution for analyzing traffic going your network and understanding which cloud apps end users are making use of. It can provide IT and InfoSec teams with the information they need to determine if Shadow IT as at work in their organization, and give them intelligence they can use to work with end users and business groups to ensure they're following corporate policy for cloud based collaboration. 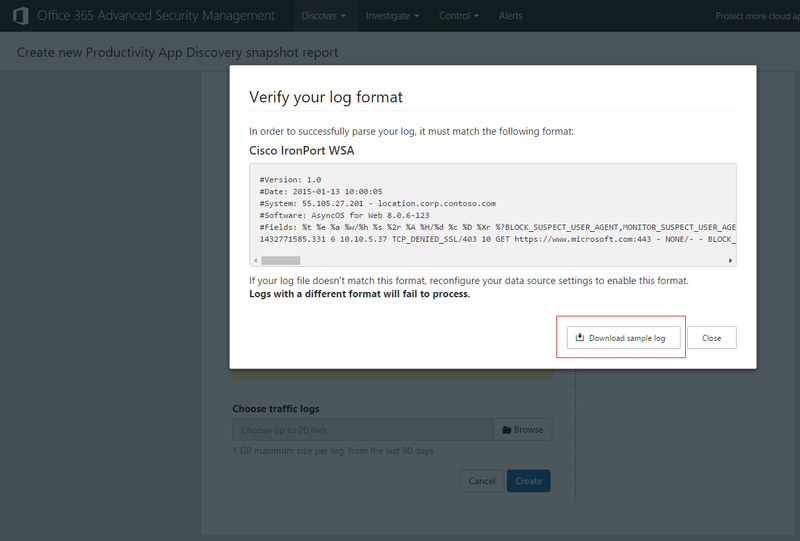 As mentioned above, the upload of log files is a manual process and we're limited to having 10 reports in the dashboard at a time. I think this can still be a beneficial solution to enterprises in circumstances where you want to perform adhoc analysis a firewall or network security log, as part of a regular IT security audit or when investigating suspicious network activity. 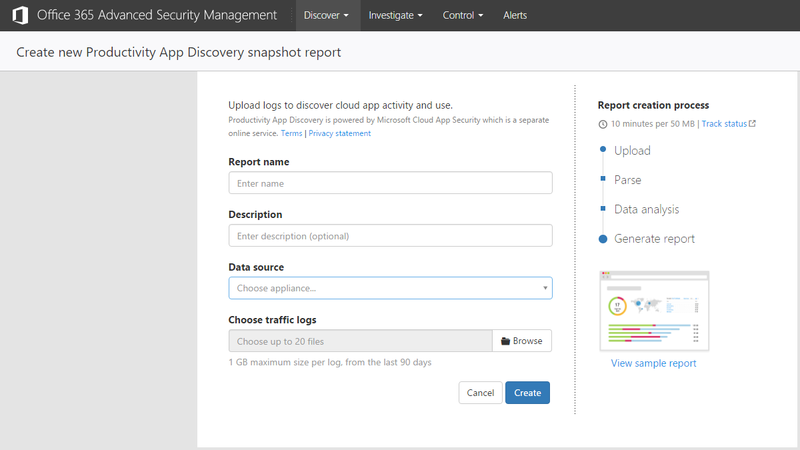 If you want to make ongoing use of this capability however and have log files uploaded automatically then for now you'll need to upgrade to the larger Cloud App Security solution from Microsoft. You can learn more about Cloud App Security here What Is Cloud App Security, and I may also cover it more in a future post. 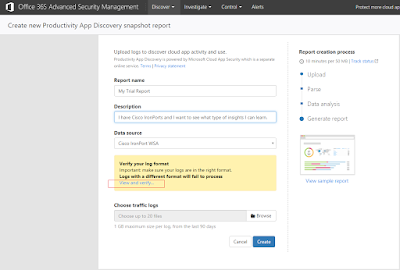 This post was a fairly thorough review of the Productivity App Discovery Dashboard feature within Office 365 Advanced Security Management. The next post in this series will look at how security policies and alerts are in fact configured and how they work within ASM. Any idea why this message appears? Is there another licensing level that provides this drill down capability? The dashboard is great but I can't drill into the underlying data? 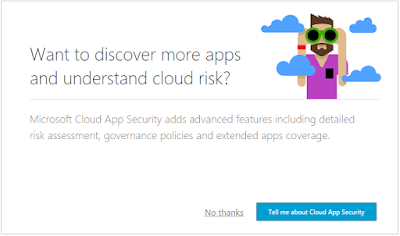 All the info I can find states that Cloud App Security is included with O365 E5 license. I'm currently running a trial of E5 license. Thanks for sharing this article. Have a glimpse at this page.